I’m totally freaked out right now. 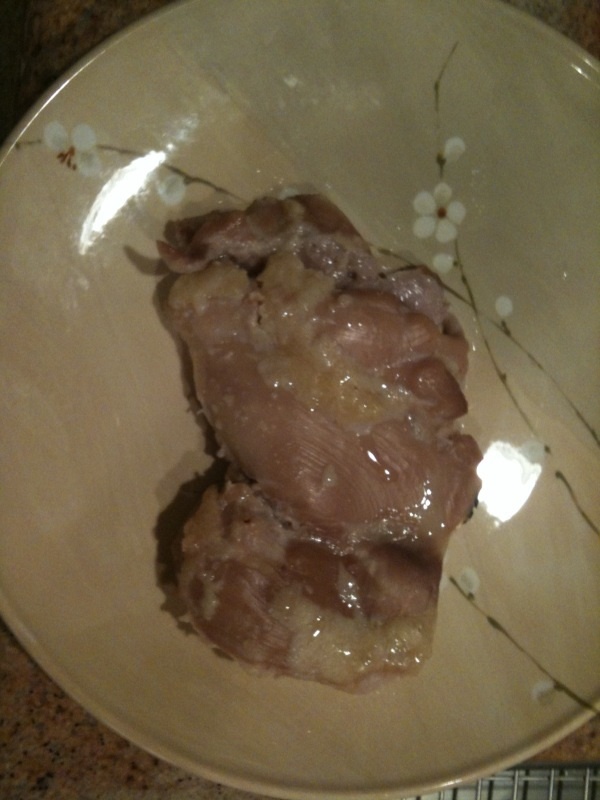 I bought some skinless, boneless chicken thighs for my dogs at Von’s today. They eat chicken and rice for dinner. So when I opened the package of chicken thighs I pulled the first thigh out and noticed that it completely covered my hand. I have big hands and this thigh was so enormous it completely covered my hand. I noticed that the flesh seemed unusually tender in a weird,” it feels like I can’t touch it” way. I also noticed that the smell was different – forced fake chemically enhanced no-smell scent. There was no doubt in my mind that this was a chemically enhanced piece of flesh. I was nauseated at the thought of these chickens being pumped with chemicals and hormones to the point where they could only sit in their feces and wait to die. We’ve all seen the videos of the chickens with their breasts being so enhanced they can’t walk. It’s the whole body including the thighs that enslave them to their body weight. They can’t move. At ages when they are babies they are at least triple the size of adult chicken. You don’t need to provide an open range. They can’t walk even if they were free. These were seriously freaky JUMBO thighs. I cooked the meat and when I took it out and cut it up for my dogs it seemed so fake and it was a tendery-rubbery kind of consistency. There was no smell and I’m sure there was no taste. I have to find a good vegetarian diet for my dogs. I really don’t eat meat. I do cook chicken for my dogs and felt bad that I was doing so but didn’t know of an alternative. I’m going to do some research on vegetarian dog diet and I’ll keep you posted.